In a remarkable tourist region, South Brittany, at the Pointe de Trévignon facing the Glénan islands (between Concarneau and Pont-Aven), Camping La Pommeraie de l'Océan **** welcomes you to a magnificent site 8ha green and flowery, just 1km from sandy beaches creeks and the port of Trévignon. These magnificent coastal landscapes are accessible from the campsite by a wooded walking trail located 250m from which you can discover the coasts of South Finistere and the wealth of local heritage. 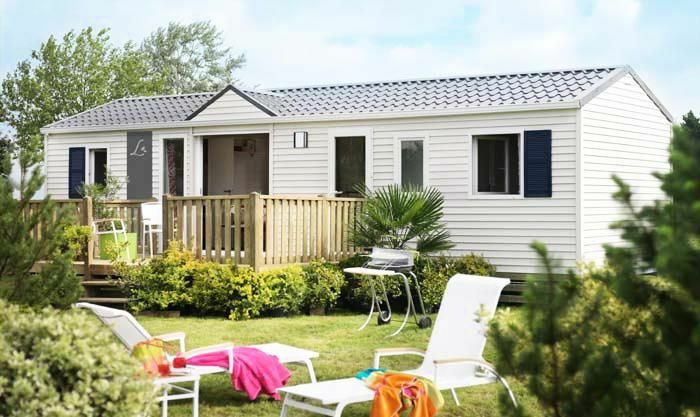 This family campsite welcomes you in recent and well equipped mobile homes with wooden terrace and offers many activities and free entertainment for young and old. You will have access to its covered water park of 450m ², heated to 28/30 ° C with balneotherapy, current river, aquabikes, deckchairs with massaging jets, gooseneck and space aqualudic for the small ones. There is also an outdoor pool heated to 28-30 ° C, as well as a wading pool and whirlpool and waterslides with 3 slides. The campsite offers a children's club for 3/9 years in July / August, and a Teen Club for 10-17 years. You can also enjoy the many sports and leisure facilities available to you. Louisiana model mobile home (2013) of 40m² that can accommodate 6/8 people, consisting of a bedroom with a double bed, a bedroom with two single beds and a bedroom with two single beds and a single folding bed, separate toilet, two bathrooms with shower and a living room with a sofa and a kitchen area. Wooden deck, garden furniture, deckchairs included. The Mobil Home includes a kitchen area equipped with fridge / freezer, microwave, coffee maker and crockery for 8 people. It also includes a garden furniture with deck chairs, a barbecue. Duvets and pillows are provided. Heating. Free parking. 1 place per accommodation. Tourist tax (surcharge): 0. 61 € / person / day from 16 years. TV: common TV area. Rent 31. 5 € / week 4. 50 / night (on request). Restaurant: ice cream parlor, bar and snack on site (open in July / August). Horse riding: pony rides on site (paying). Equestrian center at 8kms. Hiking: many hikes possible in the surroundings. Games room: including billiards and table football. Covered swimming pool: 450m² heated to 28/30 ° with: balneotherapy area, running river, aquabikes, deckchairs with massage jets, water playground for children. Multisports ground: yes with basketball court, football, tennis, badminton, handball, volleyball.